Doctors use to tell patients who had multiple vague complaints that it was all in their head -- they were exaggerating their symptoms. That's because the symptoms didn't fit into any accepted medical textbook diagnosis: aches and pains all over that body that came and went + a constant feeling of tiredness + lack of well-being + many restless nights of broken sleep. But we now know better. They finally gave it a medical name -- Fibromyalgia. Even though it's under the rheumatology heading of medicine, they still don't fully understand it. They just know the symptoms and then try to target the problems with multiple Rx drugs. 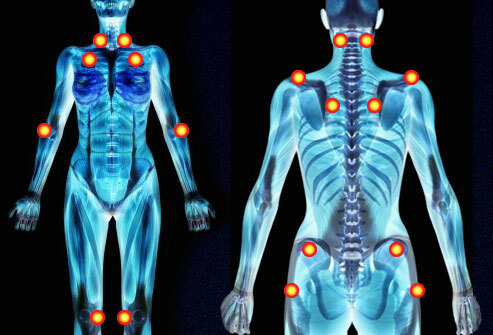 Because the symptoms hit many different trigger points -- most often the neck, shoulder, lower back, hips, shin, elbows, or knees -- the associated pain and fatigue make them feel lousy.Fibromyalgia is where the safe, effective herbal remedies do their "thing" by targeting the symptoms and going at the root cause of stress and pain. The adrenal glands are the body's primary stress responders. But the adrenal glands are under the control of the pituitary gland in the brain, and the pituitary gland also has a "boss" that controls it, called the hypothalamus. This stress responding trio is called the HPA (hypothalamic-pituitary-adrenal) axis.In fibromyalgia patients, the HPA axis functions abnormally and causes a lot of other things to get out of whack. Hence, the herbal "tonics" that refurbish the HPA axis include such master pieces as panax ginseng + ashwaganda + eleuthero + licorice + astragalus + ginger extract. One such superior product made by Thorne Research is called PHYTISONE.Another hypothesis in ridding the body of fibromyalgia by going to the root of the problem is bolstering the immune response. Viruses and poor immunity also seem to be one of fibromyalgia's hallmarks. Everybody knows what the "flu-like" symptoms feel like when the immune system gets discombobulated. Hence, boosting the immune system and keeping it operating as efficiently as possible is key. One of the best herbal ways to do this is by long-term supplementation with glutathione (Setria).